People laughed when I entered the room with my ukulele in hand... that's a common reaction to the uke from people who don't appreciate its versatility or range. It looks small, so it must be a toy or a novelty instrument, they think. It can't be a serious instrument they imagine - but it has been taken very seriously in Hawaii for more than a century. Many musicians are taking it very seriously, today, too. But serious doesn't mean it's not also a lot of fun. 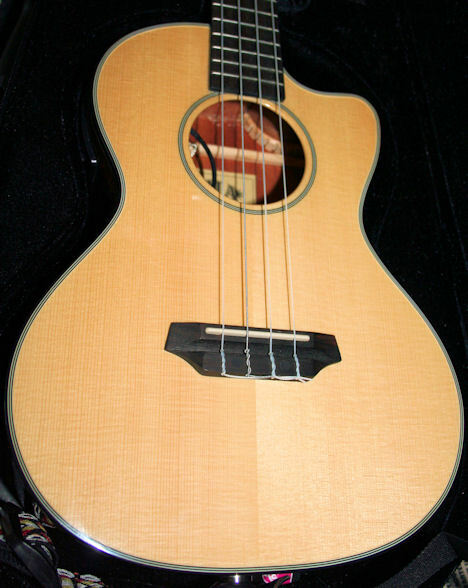 A uke looks like a small, four-string guitar. 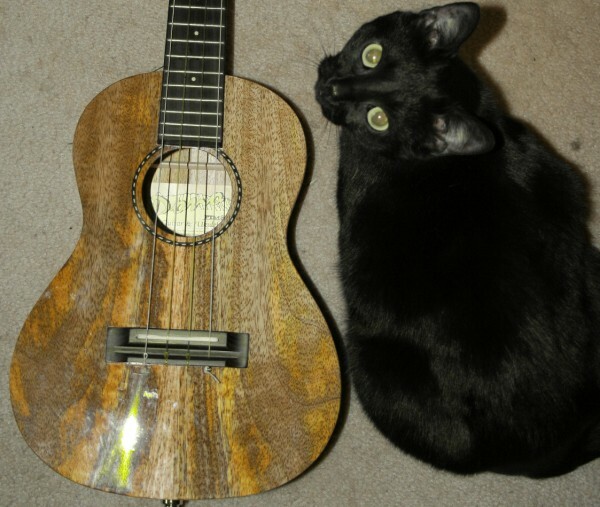 Ukulele owners may blanch at that description, but it's fair, given its ancestry. You could equally think of a guitar as a fat ukulele. They're cousins. And the uke can do pretty much everything a guitar can do. To be technically correct using musicology terms, a ukulele is classified as a chordophone in the plucked lute group of musical instruments. That makes it a member of the of the same family as the guitar, but not exactly a guitar. Banjos, lutes, even violins and fiddles are close relatives. 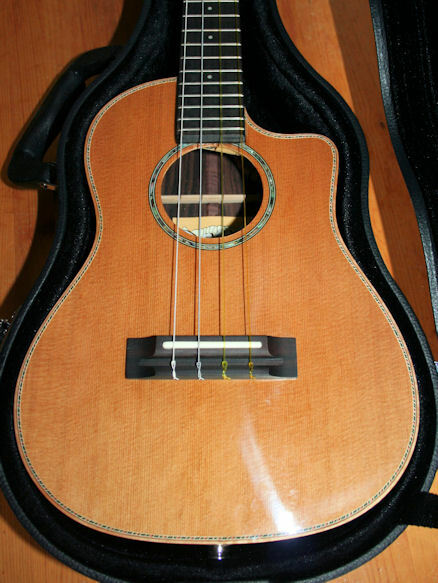 Ukuleles usually have four strings, although six- and eight-stringed versions exist (these always pair with an existing string, either the same note or an octave apart). 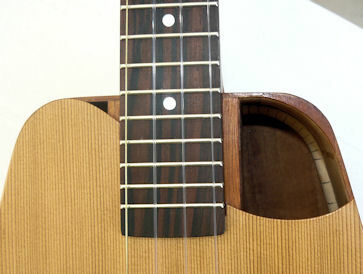 Uke strings are tuned like the higher four strings on a guitar; the same relationship exists between strings, except five frets higher than the guitar. 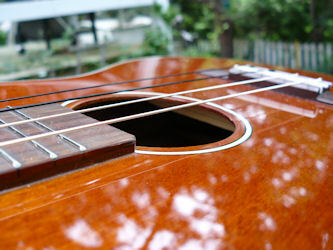 Those same strings on a guitar are tuned D-G-B-E, but a ukulele (soprano, concert and tenor) is tuned higher, at G-C-E-A (or A-D-F#-B: see the section on tuning). This generally makes the transition from guitar to ukulele (and vice versa) fairly easy. Baritone ukes are bigger and tuned D-G-B-E, like a guitar (which sometimes causes their critics to belittle them as just short-necked or tenor guitars). However, the traditional uke is tuned with the fourth (G) string an octave higher. This is called re-entrant tuning. So it's the same note, just higher and brighter. If you're a guitar player, you can play the same chords and finger picking patterns on a uke, but the high-G string creates a different sort of sound. 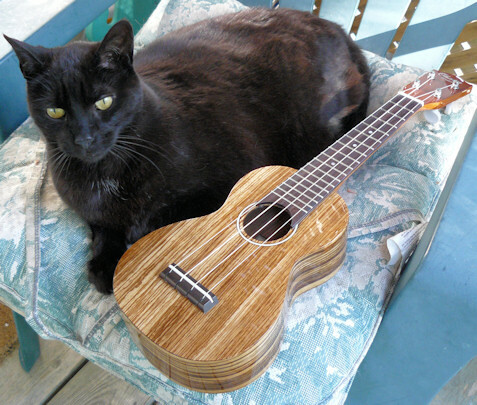 Ukuleles are small, as you can see by the photo below, with our tiny cat Abbey and my tenor uke (a Pono mango). That makes them easy to hold, and not as intimidating as a larger instrument. It also affects their sound reproduction (see tonewoods). There are also five-, six- and eight-stringed ukuleles, with paired sets of strings. A miniature six-string guitar is also sometimes sold as a ukulele - Yamaha makes one called the Guitalele (GL-1) and Kala makes its U-tar. Others are available - four- and six-stringed cigar box guitars for example. Plus there's Kala's new U-bass (see my review). So the uke family isn't constrained to a mere four-strings on a small body. Ukuleles have been around for less than 150 years, but they descend from a long line of small stringed, guitar-like instruments similar to those still played in Mexico, Latin America and other parts of the world, today. Although ukes originated in Hawaii, they spread quickly around the world to become the most popular musical instrument in the 1920s and 1930s. More on that in the history section. Possibly the most difficult thing about learning to play the ukulele for me was unlearning some entrenched guitar habits. I initially over-reached, trying to find bass strings that weren't there, or to reach for frets that were much closer than I expected, and then feeling cramped in the small space. But you adjust with practice and persistence. Now I find guitars harder to play because they have so much space and those extra strings... not to mention all that weight. Newcomers of course don't have to overcome old habits. But like learning any musical instrument, it takes time and a lot of practice to become proficient. Practice is the only answer to the question, "How do I get better?" The playing style many prefer lends itself to a strumming/picking style, usually without a pick (although a few people use a pick to strum - see the section on picks). My own hybrid style comes from playing a lot of folk music in the 1960s and 70s. My guitar heroes included John Fahey, Leo Kottke and Fred Neil. But when I listen to George Formby again, I appreciate how good you can be as a strummer on a ukulele. But I also use a pick sometimes. As uke writer and player, Al Wood, wrote, "Playing the ukulele marks you out as being a bit different. While most people are hacking away on guitars and pianos, we choose to pursue something a little bit different." As the uke rapidly grows in popularity, that "difference" seems to get less and less! Enjoy my newly-revamped site and please update your bookmarks or favourites if you had it previously stored. Use the menu bar at the top to read the other pages. Comments and suggestions are appreciated. If you don't see a menu bar at the top, you need to tell your browser to unblock content so the script for the menus work. Lots of companies are getting on the bandwagon, as the popularity of ukuleles explodes. Not just new companies (there are many of those): Fender has started making them, so has Ibanez (no tenor Ibanez models, though, so I won't be reviewing one until they have one). More are likely to come now two big guitar companies have come onboard. Plus many existing companies are expanding their line: adding upper and lower end models, solid-body models, electric models, steel-string and bass models. Can the market support them all? Unlikely. Watch for a bust to follow the boom and some companies to exit the market in the next few years. But the true aficionados will always be here, strumming.